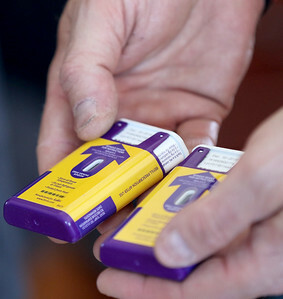 Matthew Apgar - mapgar@shawmedia.com Michael Young, back, and Jason Beaty, both recovered heroin users, are freely distributing Evzio, an opioid antidote contained in an auto-injector cartridge, on Thursday, Feb. 11, 2016 in Ringwood. The drug is used to save lives in heroin and other opioid overdoses. Matthew Apgar - mapgar@shawmedia.com Michael Young holds Evzio injection cartridges on Thursday, Feb. 11, 2016 in Ringwood. The cartridges are being distributed for free by Young and Jason Beaty in hopes of saving lives from heroin overdoses. 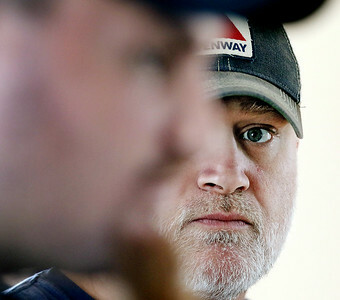 Matthew Apgar - mapgar@shawmedia.com Michael Young, left, and Jason Beaty, both recovered heroin users, are freely distributing Evzio, an opioid antidote contained in an auto-injector cartridge, on Thursday, Feb. 11, 2016 in Ringwood. The drug is used to save lives in heroin and other opioid overdoses. Matthew Apgar - mapgar@shawmedia.com An Evzio injection cartridge sits on a table on Thursday, Feb. 11, 2016 in Ringwood. The cartridges are being distributed for free by Michael Young and Jason Beaty in hopes of saving lives from heroin overdoses. 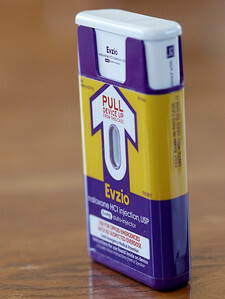 Michael Young, back, and Jason Beaty, both recovered heroin users, are freely distributing Evzio, an opioid antidote contained in an auto-injector cartridge, on Thursday, Feb. 11, 2016 in Ringwood. The drug is used to save lives in heroin and other opioid overdoses.